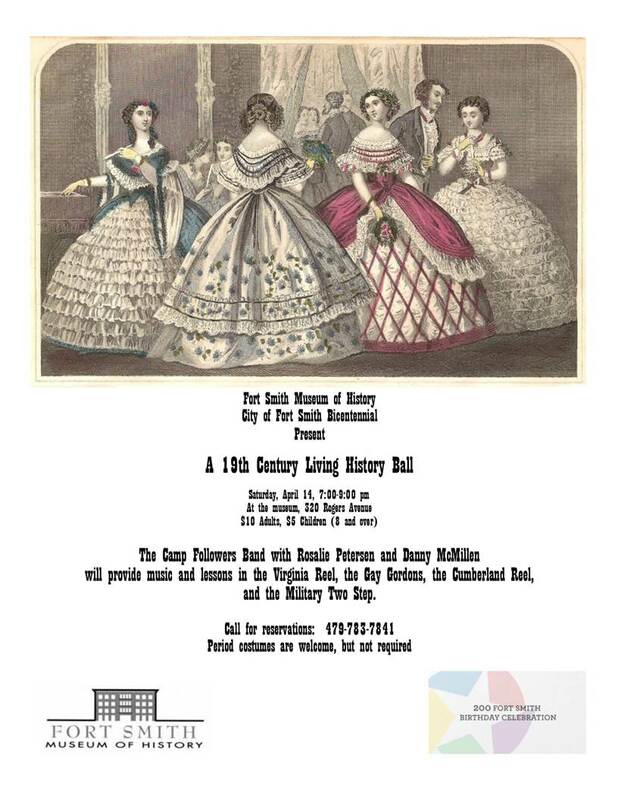 In celebration of the City of Fort Smith Bicentennial, the Fort Smith Museum of History presents a 19th Century Living History Ball on Saturday, April 14, 7:00-9:00 pm. Join the Camp Followers Band for live music, traditional dances, period refreshments and history coming to life! The ball is reminiscent of those held at the garrison at Fort Smith, at Adelaide Hall and in fine homes of the city. Rosalie Peterson and Danny McMillen from Missouri will instruct guests in the Virginia Reel, an old American dance; the Gay Gordons and the Cumberland Reel, Scottish country dances; and the Military Two Step. Period costumes are welcome but not required. $10 for adults and $5 for children 8 and over. To purchase a ticket call 479-783-7841, stop by the museum or mail a check to 320 Rogers Avenue. Tickets may be purchased at the door subject to availability. Proceeds benefit the Fort Smith Museum of History, a 501 (c) 3 non-profit organization. Prints of paintings by Michael Haynes, including “The Founding of the Fort Smith” will be available for purchase. Celebrate the 200th birthday of Fort Smith and learn about and experience the rich legacy of our city.